Home What’s in store for the exile? What’s in store for the exile? The political fallout from the resignations of ministers Ravi Karunanayake and Wijeyadasa Rajapakshe are still being felt within government, the latter more than the former, even as the Joint Opposition hands over yet another motion of no-confidence, this time against Health Minister Rajitha Senaratne. Karunanayake’s resignation, in a sense, was straight forward enough. Following evidence led at the Commission of Inquiry into the sale of Central Bank Treasury bonds, it emerged that the controversial Bond dealer Arjun Aloysius had paid the rent for apartment Karunanayake’s family resided in. That there was a conflict of interest was apparent and, after resisting for a few days, Karunanayake bowed to pressure from the public, the opposition and his own party and resigned from the Cabinet after making a speech in Parliament where he noted that he has not been found guilty of any wrongdoing. Rajapakshe was different. His own party, the United National Party (UNP) was moving to submit a motion of no-confidence against him on the grounds that he was violating the collective responsibility of the Cabinet by opposing the sale of the Hambantota port to Chinese interests. He was also charged with stalling investigations against individuals in the previous government. Rajapakshe dug his heels in and the UNP had to request President Maithripala Sirisena to remove him, which the President did. It is understood that Prime Minister Wickremesinghe attempted to defuse the crisis that was erupting over Rajapakshe in the party. In discussions with the renegade minister, the Prime Minister is reported to have offered Rajapakshe the choice of remaining in the Cabinet with the Buddha Sasana portfolio if he was to apologise for his conduct. Rajapakshe was adamant and refused the offer and had to be removed. Rajapakshe’s replacements have been announced. Thalatha Atukorale has been appointed Minister of Justice while Gamini Jayawickrema Perera has been appointed Minister of Buddha Sasana, in addition to the portfolios they now hold. Atukorale is also the Minister of Foreign Employment Promotion and Welfare. She is the sister of the late Gamini Atukorale who was once deputy minister to Ranil Wickremesinghe. Gamini Atukorale was also a long time General Secretary of the UNP when Wickremesinghe was its leader. He passed away on New Year’s day in 2002after a sudden illness, shortly after the UNP came into office. He was then Minister of Transport, Highways and Civil Aviation. Thalatha Atukorale entered politics after her brother’s death and is reputed for being outspoken. She has in the past criticised the party leadership when the UNP was in the midst of a leadership crisis. As the new Minister of Justice, Atukorale has already pledged to expedite corruption related cases. Gamini Jayawickrema Perera is an old faithful of the UNP, being one of three parliamentarians who entered the legislature in 1977 and are still in Parliament, the others being Prime Minister Wickremesinghe and Leader of the Opposition R. Sampanthan. Perera also holds the portfolio of Sustainable Development and Wildlife. After the drama over Rajapakshe’s resignation last week, questions were being asked about his political future, the most obvious being whether he would join the Joint Opposition (JO). Rajapakshe remained tight-lipped saying only that he will take a decision about his future in due course. At present, he remains a member of the UNP. He is also a member of the Constitutional Council, a position he may continue to retain as there appears to be no provision to remove members of the Council. Rajapakshe was seen at the Bellanwila temple last Friday, as the temple staged its annual ‘perahera’. Attending the same occasion alongside the deposed minister was former President Mahinda Rajapaksa, fuelling further speculation. However, the body language between the two, while cordial, did not suggest a great camaraderie and Wijeyadasa Rajapakshe seemed uneasy in the former President’s presence. Former President Rajapaksa would not have forgotten that Wijeyadasa Rajapakshe once left his Cabinet causing much embarrassment to his government. Nevertheless, Wijeyadasa Rajapakshe now stands accused of protecting the Rajapaksa regime and politics has seen stranger bedfellows get together when their mutual needs dictate that they do so. However, if Wijeyadasa Rajapakshe expected a red carpet welcome from the JO, he would have been disappointed. In the events leading up to his dismissal, there was some speculation that he would be the next ‘common candidate’ from the JO, presumably for the next presidential election. This rumour was gaining such currency that the JO was compelled to officially deny it. Addressing a news briefing, parliamentarian Dilum Amunugama said the Joint Opposition never sought a common candidate and would not do so in the future. “We will field our own candidate, not a common candidate,” he said. However, asked if the JO would accept Wijeyadasa Rajapakshe to their party, Amunugama said they would accept not only Rajapakshe but anyone who was willing to join them. Wijeyadasa Rajapakshe, the astute reader of politics that he is, must realise he cannot chart a political journey on his own- he needs an established political party to be his vehicle, if he has greater political ambitions. When he quit the Rajapaksa cabinet, he joined the UNP. Therefore it is now highly likely that he would now revert to the JO, perhaps after a decent time period. However, he would then face the issue of how he could join the same group of persons he cited as corrupt and criticised vehemently in the name of good governance in the lead up to the presidential and general elections in 2015, a tactic which then endeared him to the public. Therefore, if he does join the JO, he risks being classed as yet another political opportunist. As he remains in the UNP at least for now, Rajapakshe still retains the option of remaining a backbencher, maintaining a low profile and then re-emerging, perhaps with a different portfolio. This is the strategy that Ravi Karunanayake hopes would be successful for him. However, at this point this seems unlikely as Rajapakshe spurned all the offers of a compromise that were offered to him by the UNP leadership which valued him more as an asset than as a liability. Already, Rajapakshe has indicated that he will not be maintaining a low profile or toeing the UNP’s line. “This is an attempt to sweep the bond scam under the carpet by sacrificing me. In Sri Lanka's history, this is the first time a minister was accused of not influencing the judiciary and the Attorney General’s Department whereas former justice ministers had been accused of influencing the judiciary,” were Rajapakshe’s scathing remarks to the media following his removal. It seems that Wijeyadasa Rajapakshe has decided that his course of action, though questionable in the short term, will yield long term political dividends by increasing his popularity, just as his resignation from the Mahinda Rajapaksa Cabinet did. The government meanwhile is bracing for another no-confidence motion, now against Health Minister Rajitha Senaratne. Senaratne entered Parliament from the UNP at the last general election but, as one of the few ministers to walk out of the Rajapaksa Cabinet along with Maithripala Sirisena, he enjoys a special relationship with the President. The no confidence motion against Minister Senaratne cites several issues, the alleged inability to deal with the Dengue epidemic and the controversy over the South Asian Institute of Technology and Medicine (SAITM) being among them. Unlike the motions of no-confidence against Ravi Karunanayake and Wijeyadasa Rajapakshe, the motion against Senaratne has little realistic chance of success. Sections of the Sri Lanka Freedom Party (SLFP) may not approve of Senaratne’s policy towards SAITM but President Sirisena is likely to prevail over them to refrain from voting for the motion, even if they wished to do so. The UNP, of course, will fully endorse Senaratne and oppose the motion. It is not that the JO is unaware of this. 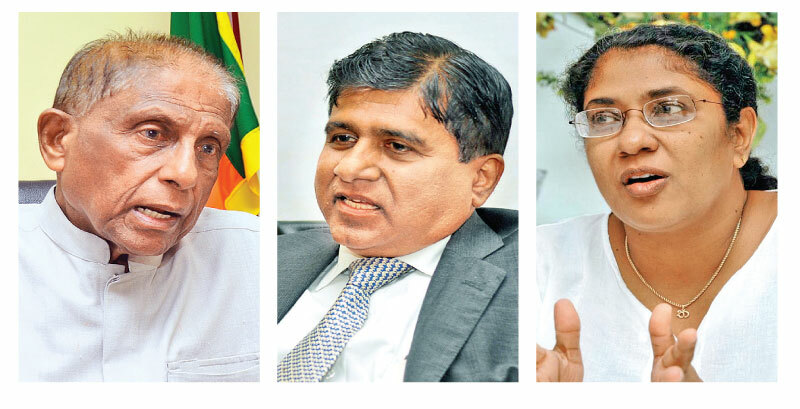 However, given the impact the motions of no-confidence against Karunanayake and Rajapakshe have had, they will relish the opportunity to have their say, even if Senaratne finally has his way. For the JO, it will be an exercise in public relations within the chamber of Parliament, no more, no less.